May I make a very bold statement today? Here we go: Everything tastes better with tahini.There, I said it. These days, I hardly have a meal without tahini. It's either in my hummus, or in the dressing over a huge bowl of veggies or as a sauce to go with my falafels or some noodles. And now also in my soup. As summer comes to a close, it's time to cook more soups again. Something comforting with a variety of vegetables and spices inside that help you protect from the colds and flus that often come along with a change of season. My spice mix includes coriander, cumin and turmeric. Especially the two latter ones are known to have great anti inflammatory effects on your body and should actually be consumed regularly. They strengthen the immune system and help weight loss by increasing fat metabolism. Garlic promotes the well-being of the immune systems with antioxidant properties. It is also cholesterol lowering. Carrots have great antioxidant properties and and are full of vitamin A, B and E. Tahini is a gold mine for vitamin B and calcium. Because it's ground up, it is very easy to digest, and the nutritional properties will be in your bloodstream within 30 minutes after consumption. After this little scientific list of nutritional properties I will not leave you before emphasizing how good this soup tastes. The sweetness of the carrots is bounced off against the punch of the spices and the tahini adds a lovely nutty flavor to it. That's carrot soup taken to another level. Enjoy! In a pan, heat olive oil over medium heat. Add chopped onions and cook until translucent, about 3 minutes. Add minced garlic and cook for another minute. Stir in all spices, salt and pepper. Now add the chopped carrots and saute for 2-3 minutes. Add water, increase heat to high until it comes to a boil. Cover with lid then cook over medium heat until carrots are thoroughly cooked. Take off the heat and let cool for about 10 minutes before stirring in the tahini. In a food processor, blend the soup until smooth. Reheat of necessary. 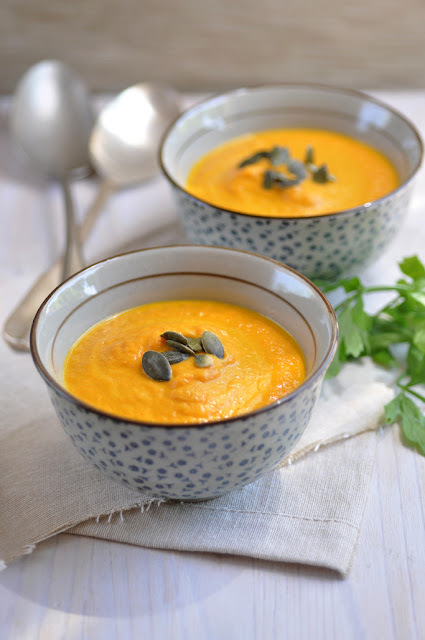 Transfer soup to serving bowls and garnish with pumpkin or sesame seeds (optional). Serve immediately.